This is an incident that occurred many years ago but has stuck in my memory ever since. I was departing a certified, but remote, gravel strip in North Queensland in a C182 early one morning with three people on board, all within take-off weight and balance with fuel and length of strip. At that time, I held a private pilot licence (PPL) with about 300+ hours flying C172’s, C182’s, C206’s, Piper Warriors and a Mooney, and I also had about 10 hours flight time in a C310 so I felt that I had some sound hours and experience under my belt at the time. The strip was well formed and well maintained, and it had a gradual rise from each end up to the middle so initial take-offs were uphill until about halfway down the strip then it was a downhill slope. I commenced the take-off roll and became airborne just as we approached the centre of the strip and as we started to climb out I could ‘feel’ the seat falling away from underneath me and felt that ‘something was not right’ so I immediately cut power, lowered the nose and put the aircraft down onto the strip. By this time, we were on the ‘downhill run’ and I was trying hard not to over brake and cause the brakes to lock up and skid on the gravel surface. We were slowly slowing down and then the plane crabbed over to the right and the right wheel was on the grass at the edge of the strip and while this gave additional braking grip it caused the plane to start veering to the right due to the braking differential grip on the right wheel versus the left wheel. As the plane finally slowed down it veered almost at right angles to the strip and finally came to a halt with the prop stopping about 15 centimetres (6 inches) from the rising embankment on the side of the strip. Whew! I shut down and we alighted the aircraft. I checked it all over for any damage but there was none that I could see so we pulled it back out onto the strip and I taxied back to the parking bay to gather my thoughts and try to work out what had caused the ‘sinking feeling’ when I lifted off. I did a full airframe check including elevator controls etc. and I could find nothing wrong so eventually I decided to try another take-off. Having done a thorough pre-flight we boarded the plane and I proceeded to work through the pre-start/take-off checklist and it was then that I found what had caused the incident on the first take-off attempt. ‘Trim set for take-off’—it wasn’t. I had obviously overlooked or missed that item during my initial preparation for take-off. It was still set ‘tail down’ from the landing the previous evening when we arrived at the strip. At least I had found the cause of the seat ‘falling out from underneath me’ during the first take-off attempt. The second take-off was without incident and we took-off safely and returned to our home base uneventfully. 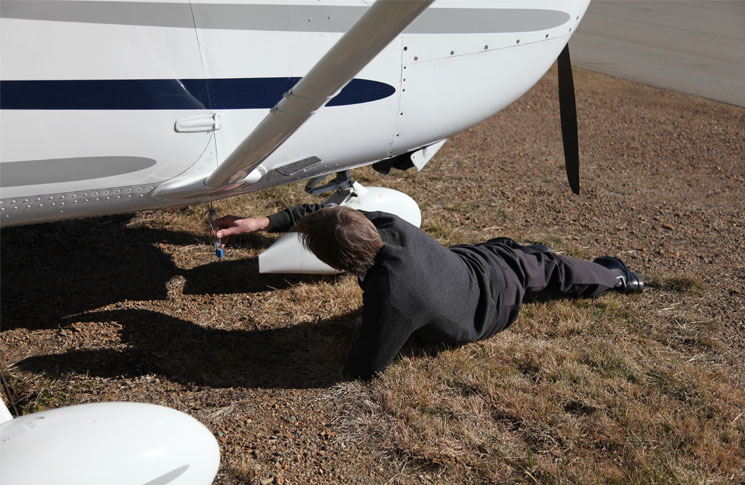 Be alert and make sure that your pre-flight checks are done observantly and with a clear mind on the task. Upon returning to home base I had the aircraft thoroughly checked out by a LAME to make sure that there had been no damage to any of the structural struts and wheels/brake etc. and it was all OK. Check list, check list, check list.